For many, the Worcester Art Museum exists solely in the abstract as the impressive-looking building touted in chamber of commerce literature for its world-class treasures. Indeed, it is that. But for Clark University the museum, affectionately known as WAM, is something even more tangible — an active partner that gives students and faculty an opportunity to help plan and execute major exhibitions. A pair of events this academic year drew attention not only to the art itself but to the unique collaboration between two of Worcester’s prominent cultural and academic institutions. John Garton, associate professor of art history, curated the exhibition “The Jeppson Idea Lab: Olmec Incised Standing Figure,” on display from Nov. 14 through April 3 in a section of the museum dedicated to showcasing single objects from the permanent collection. Focusing on Garton’s research, the presentation examined the stone figurine (circa 800 BCE) from the pre-Columbian civilization of the Olmec, Mesoamerica’s earliest flourishing culture. 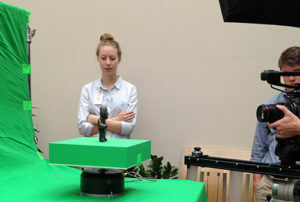 Incised Standing Figure at a video shoot. Elisabeth Spak ’16 helped prepare the exhibition for her LEEP (Liberal Education and Effective Practice) project by formulating content for the exhibition’s iPad display and writing the copy for the instructional guide to the collection. Garton was Spak’s faculty adviser. The University’s connection with WAM was cemented further on Feb. 18 when the Clark community descended on the museum to view “Cyanotypes: Photography’s Blue Period.” This was the first major museum exhibition in the United States exclusively devoted to the 150-year legacy of a technique that gives photographs a distinct blue tint, turning even mundane images into something ethereal. The exhibition, which earned strong reviews in The New York Times and The Boston Globe, was incubated inside the classroom of Kristina Wilson, associate professor of art history. Wilson co-taught the cyanotypes course with Nancy Burns, the museum’s assistant curator of prints, and the two co-curated the WAM show. But they were hardly alone. The 11 Clark students in the semester-long seminar researched the cyanotype works of various artists and contributed exhibition catalogue essays that, for some, provided an opportunity to visit galleries and museums, speak with artists’ representatives, and reconstruct histories of photographers both renowned and obscure. The student team also worked closely with museum staff to learn the details of how an exhibition comes together. They met with experts on matting and framing as well as exhibition design; they learned from a paper conservator and even consulted with a graphic designer about the catalogue’s presentation, right down to the choice of fonts. Burns supplied the insider’s perspective on making targeted acquisitions of art and securing loans from private collectors and galleries. For the grand opening, Wilson’s students were stationed throughout the exhibit hall, describing to visitors the history and technique behind each work. Speaking at the “Cyanotypes” event, Worcester Art Museum director Matthias Waschek described the museum as a “shared university,” lauding the ongoing collaborations between his staff and Clark University. 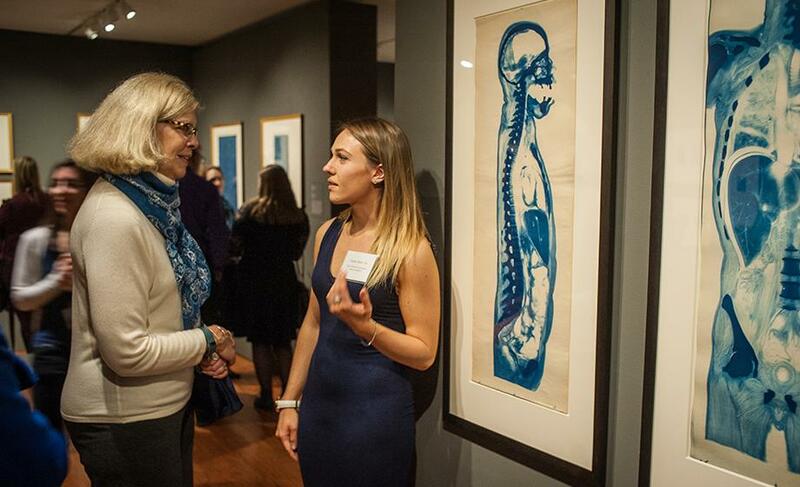 Top: Casey Shea ’16 describes the work “Body Slices” for a visitor at the opening of “Cyanotypes: Photography’s Blue Period” at the Worcester Art Museum.